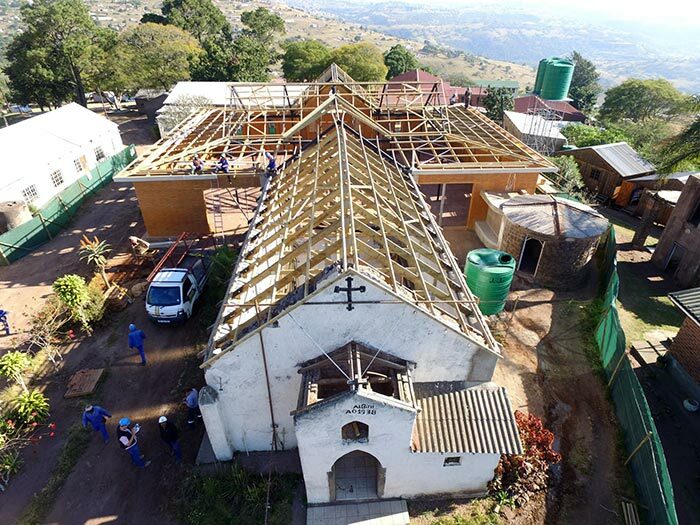 In 2014 Lead Architects undertook a development masterplan of the Albini Mission situated in KZN, Ntshongweni for the Catholic Archdiocese. Renowned construction company F.Verbaan, roofing contractor GWR Roofing together with Use-it, suppliers of Rambrick bricks have all become key contributors in the rebuilding and restoration of this AMAFA* site. The 80 year old church is receiving a restoration that is honouring its aesthetic appeal but enjoying a modern and rapid reconstruction approach following extensive community engagement and heritage approval. 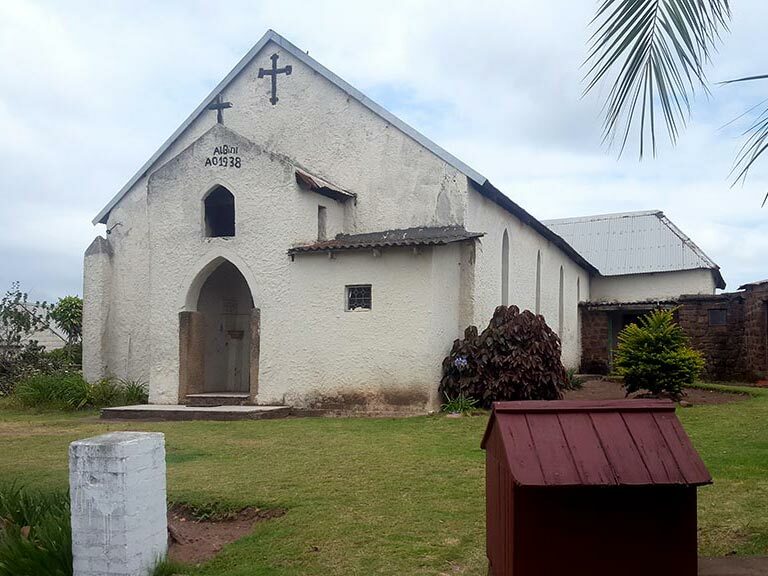 The Ntshongweni mission station was born of a promise to Mother Mary made by Fr Wagner in 1939 when he was serving for France in the Second World War. His promise was to achieve something significant as a thanks giving for sparing his life should he survive the war. 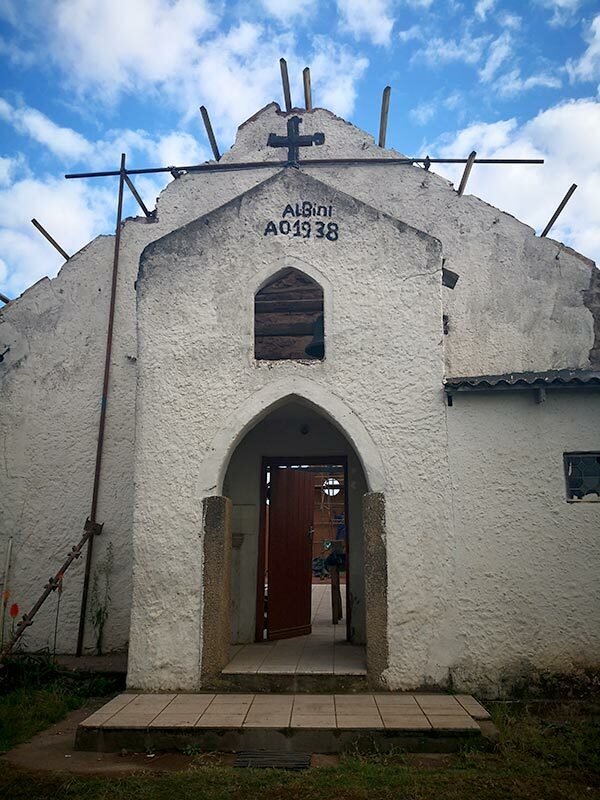 Following his release from service he returned to Ntshongweni in 1943 and true to his word established a Mission Station with himself as the permanent Priest to the original Albini Church which was built in 1938. He also established the Ntshongweni boarding school for those who travelled a great distance. In 1970 Fr Wagner passed away but his legacy was continued by Fr J Codognes. The Mission was further developed to include a school and boarding establishments. Today, key contributors such as Lead Architects, Verbaan Construction and GWR Roofing, have the privilege of continuing this legacy by expanding Albini Church and preserving its aesthetic properties. Amanda Lead of Lead Architects is responsible for creating and designing the extension of the Albini Church. Morrissey Engineers and RMI Quantity Surveyors formed part of the professional team for this project. “A bigger church was required for this growing parish, it currently only seat 90 people and is used mainly by the mission residents”, Lead reports. “The aim is to increase the space to hold a capacity of 450 people, which is indicative of the communities’ needs.” Of the three concepts that were proposed by Lead the client has proceeded with the option that preserves as much of the original church structure as possible in the centre of the site. Part of the original building needed to be demolished to make way for the large extension, however the ‘footprint’ of the original building will be evident in the internal flooring, as different texture flooring. This forms a large enough space for priests to meet in an area that is considered to have historical and religious importance. “Laying these bricks with a bonding slurry is a labour-intensive process executed by specially trained staff”, reports Verbaan. It was also agreed that community members will be involved in the building process of this site. Other special considerations such as custom-made window frames built to maintain the unique original window shapes were also one of the challenges the teams faced. In the absence of lintels, these lightweight steel frames were also designed to support the Rambricks. This church site requires utmost care to ensure that Lead Architects, Verbaan Construction and GWR Roofing complies with the original 1938 architectural and aesthetic appeal of the building. Work on the site is progressing rapidly and completion of the current phase of the project is expected to be in September 2018. 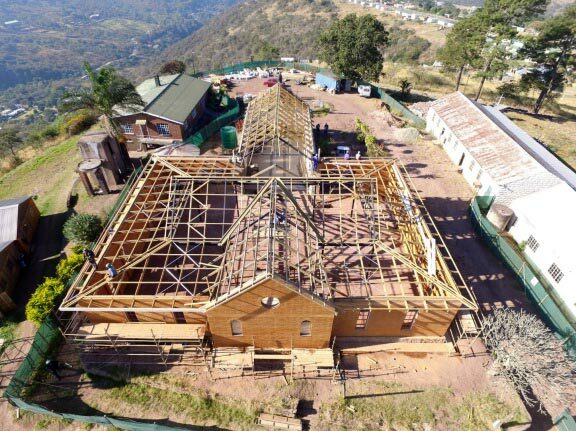 The roof construction project is divided into two sections, a new section which comprises of a steel structure with loose rafters bolted to the steel IPE and the roof of the remains of the original church which comprises of prefabricated trusses. “Due to AMAFA specifications the roof installation has been challenging. The original building is not square nor is it level, even the original wall plate heights vary significantly” reports Andrew Gove, industry roofing specialist and director at GWR Roofing. 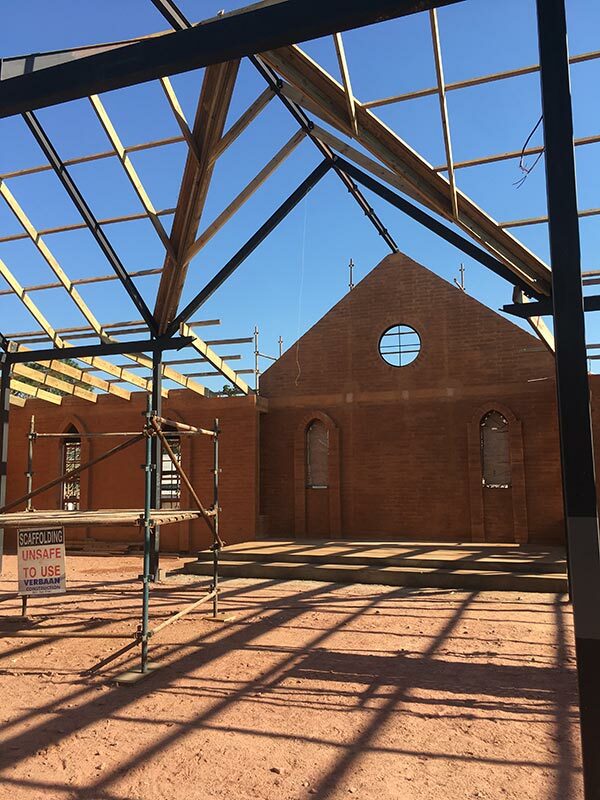 “Rafter bearing trusses have had to be designed and installed to counter these inconsistencies as well as tie into a perfectly level and square new building all the while maintaining a smooth transition between old and new with special consideration to the raked ceilings inside the Church. It is very good to know that these old buildings in the rural areas are also being preserved. We are very proud to be part of this project and enjoyed finding solutions to the various challenges we came across as we progressed”, Gove concludes. In addition to erecting the Albini Church roof and in line with its vision of creating growth and training opportunities, GWR Roofing assisted the Institute of Timber Construction by opening the site to an ITC training initiative that recently had inspectors from the National Home Builder Registration Council (NHBRC) learn the details of erecting and inspecting the installation of a timber roof structure. 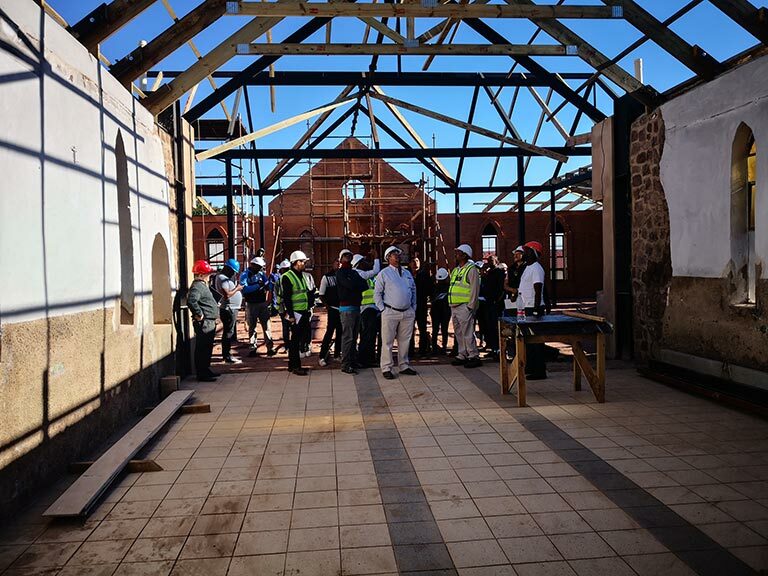 NHBRC members inspected the Albini construction site, led by Nicky Naidoo, Regional Coordinator KZN for the Institute of Timber Construction, who explained the finer details of roofing. Being a Work In Progress site, Nicky was able showcase GWR Roofing’s work to explain the ITC good practice and standards to which GWR Roofing is held accountable. Bracing, installation of roof trusses and structure stability were topics that formed part of this practical training outing to the Albini church site. “We took the NHBRC members to this particular site as it was a structure well outside the norm. It is a difficult roof to erect and GWR Roofing has the experience and expertise to complete a project of this nature. Their team deserves credit for the work done on this site”, Naidoo reports. The development & building teams conclude that this project has been both challenging and stimulating. It has stretched the parameters and offered new learning opportunities within the industry. True to religious nature, it has indeed been the catalyst for change.